Carrots are a great springtime vegetable. The more I learn about the Mediterranean Diet I see that carrots are a staple. I am enjoying exploring recipes with carrots at this time of year. 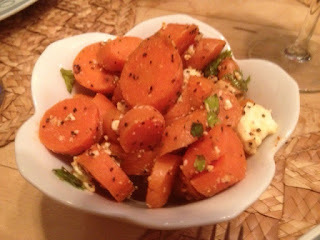 Recently I tried this Spicy Carrot Salad (112/cal--see previous blog--Greek Black-eyed Peas, for meal). It is visually very appealing. As a side dish it will brighten up any number of main dishes. The interesting aspect of this recipe is that the carrots are cooked in a spicy broth, infusing the entire carrot with the spices. This makes the flavor consistent. Because it has both paprika and red pepper (cayenne) it makes for a very "hot" taste. Ultimately it was too spicy for this family. I really like the concept, though. I want to try it out again but halve the amount of the spice and see if a milder version will work for us. Stay tuned.